Brian Boitano (B. 10/22/1963) is an Olympic and Professional figure skater who rose to prominence in the mid-late 80s after winning several World Titles and Olympic gold during the infamous “Battle of the Brians” during the 1988 Olympic Games in Calgary. Born and raised in California, Boitano was active in various sports, notably baseball and roller skating. However it was after attending a performance of “Ice Follies” that Boitano found an interest in ice skating. Shortly after he started taking lessons with Linda Leaver in what eventually became a lifelong friendship among coach and athlete. As a teenager Boitano was already a very successful athlete, having become a U.S. Junior National Champion at age 14 and selected as an alternate for the 1980 U.S. Olympic Team. He was the first person to complete all 6 Triple Jump moves in a World Championship and competed at the 1984 Olympic Games in Sarajevo where he placed 5th in competition. The following year he won his first of four consecutive U.S. Figure Skating National Championships. Building off his amazing power and athleticism, Boitano sought to push the technical limits of Men’s Figure Skating in a new era following the retirement of the famous and dominant Scott Hamilton. In 1987 Boitano added two new moves to his program, the then unknown “Tano Triple Lutz and a quadruple toe loop. 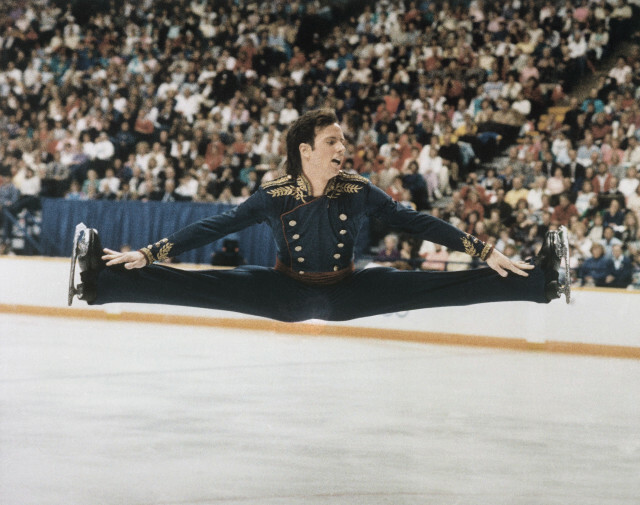 Despite never having successfully landed the Quadruple Toe Loop in competition, Boitano hoped that the event, held in Cincinnati might give him a home field advantage. Alas it was not to be, Boitano failed to land the quadruple and came in second behind rival Brian Orser. After a tough defeat, Boitano returned to training with Coach Leaver and sought to improve the weaker aspects of his program, namely in artistry. Boitano could execute technically flawless moves but lacked the extra flair that was needed to be an Olympic Champion. A self described “Jumping Robot”, Boitano hired a choreographer to help improve his program and after a short period of hard training, Boitano then prepared for the 1988 Olympic Games in Calgary. Boitano debuted his new program 3 months before the Olympics at Skate Canada which was held in the same venue that would host the Olympic competition. While Orser won the competition, Boitano’s new program and style was well received. With a standing ovation and a new found confidence, Boitano prepared for what would be dubbed “The Battle of the Brians”. Both Boitano and Orser went into the 1988 Olympics with a military themed program. With Boitano being superior in technical skills and Orser being superior in artistry, the two were tied going into the free skate portion of the competition. The outcome would determine the Olympic medal. Wearing skates with the American flag, Boitano skated a technically clean and flawless routine. Orser skated an equally dominant routine but one very small error on a jump and as a result omitted a triple axel. This move cost him the gold medal and Boitano went on to win “The Battle of the Brians” and came home with an Olympic gold. Following the Olympics Boitano won the 1989 World Championships, defeating Orser again for the title. Shortly after he turned professional and competed, very successfully in many professional level figure skating competitions. He also appeared in “Carmen on Ice” where he won an Emmy for his performance. Boitano sought to return to Olympic competition and forfeited his professional status to return as an amateur to compete at the 1994 Olympics in Lilliehammer. This was eventually dubbed the “Boitano Rule” where a professional athlete could return to amateur competition before professionals were allowed to compete at the Olympics. For the first time in his career, Boitano failed to land a triple axel and despite being a medal favorite at the Olympics, he came in 6th. Shortly thereafter he returned to professional competition. In 2014 Boitano was named as apart of the official U.S. Delegation at the 2014 Olympics in Sochi. As a result Boitano publicly came out as Gay in response to Russia’s passing of anti-gay propaganda laws. During his career, Boitano was advised to keep his sexual orientation private as coming out would have cost him endorsements. While the people closest to him always knew but Boitano wanted to let his skating achievements speak for themselves and chose to keep his personal life private. Brian Boitano currently lives in San Francisco and is featured on a cooking show What Would Brian Boitano Make?